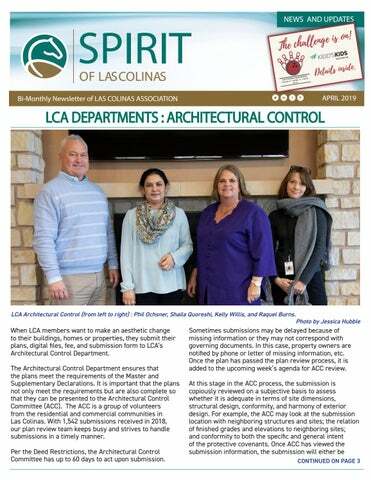 LCA Architectural Control (from left to right) : Phil Ochsner, Shaila Quoreshi, Kelly Willis, and Raquel Burns. When LCA members want to make an aesthetic change to their buildings, homes or properties, they submit their plans, digital files, fee, and submission form to LCAâ&#x20AC;&#x2122;s Architectural Control Department. The Architectural Control Department ensures that the plans meet the requirements of the Master and Supplementary Declarations. It is important that the plans not only meet the requirements but are also complete so that they can be presented to the Architectural Control Committee (ACC). The ACC is a group of volunteers from the residential and commercial communities in Las Colinas. With 1,542 submissions received in 2018, our plan review team keeps busy and strives to handle submissions in a timely manner. Per the Deed Restrictions, the Architectural Control Committee has up to 60 days to act upon submission. For Good Friday, LCA offices will close at noon on Thursday, April 18th and reopen on Monday, April 22nd. Also, in observance of Memorial Day weekend, LCA offices will close at noon on Friday, May 24th and reopen on Tuesday, May 28th at 8:00 am. SAFETY: For many, springtime means spending more time outside or in your garage. LCA Security Services wants to remind you to keep an eye on your personal property and don’t leave unattended. In 2018, LCA Security Services were notified about 4,101 open garage doors in the development. Remember that property theft is a crime of opportunity; let’s close the door on it. approved, disapproved, or deferred. Meetings are open to members for observation and held on Thursdays every week from 12pm-2pm, alternating weeks between the commercial and the residential groups. Keeping the alternating weeks in mind, it may take up to 14 days for a submission to make it on the agenda. Other things to know: Our Architectural Control Department is made up of a Director, with over 29 years at LCA, two Plan Review Representatives, and an Administrative Assistant. 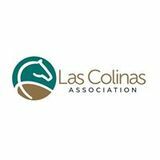 For questions, send an email to plans@lascolinas.org or call 972-541-2345. Venture X is located at 955 West John Carpenter Fwy, Suite 100 in Irving, Texas. Venture X Las Colinas opened for business last January. equipment such as fax machines, copiers, audiovisual equipment, as well as professional looking office furniture. Amenities can include reception services, a kitchen, as well as private offices cut off from the rest of the space. Las Colinas has other modern office spaces that are similar to WeWork and Venture X. Regus has several office spaces in Las Colinas. One of their office spaces, the 10th floor of MacArthur Center II at 5605 North MacArthur Blvd, has meeting rooms, a business lounge, and co-working spaces. Memberships range from pay-as-yougo to fixed term. Between WeWork, Venture X, and Regus, Las Colinas offers lots of office space options for the big business, entrepreneurs, and startups. Is this the future of the modern office? Will employees get used to sharing their space with others from different fields and companies? Time will tell. 2019 Annual Flag Lease is only $45 for the year. Thank you! We do appreciate your support! What makes an amazing margarita? Balance. Ingredients. Tequila. Cinco de Mayo is around the corner and the ‘Rita is a summertime staple. Las Colinas has over 200 restaurants and several places are serving up margarita madness year-round. When you want something smoky and sweet The Ranch has a Smokey Sweet Pineapple Margarita which utilizes a smoky and earthy mezcal called Illegal Mezcal Joven. The smoky flavor is balanced and amazing in this drink. Add in some freshly squeezed pineapple juice and muddled jalapenos, you have a savory and sweet ‘rita. Salted rim included, of course. When you want something frozen El Famoso’s frozen Hibiscus Margarita is made with Herradura Silver Tequila, Cointreau, fresh lime, Hibiscus infusion, and simple syrup. Herradura Silver Tequila is sweet, citrusy, and aged in American Oak barrels for 45 days. The natural flavor of hibiscus is tart and cranberry-like which makes this beverage the perfect frozen drink. This drink stands alone, no need for salt or sugar on this rim. quintessential ‘Rita The Classic Margarita at Two Mules Cantina at Texican Court is the vintage Cinco de Mayo celebratory drink. A low-ball glass filled with ice, El Jimador Silver Tequila, fresh lime juice, and orange liquor, Cointreau. This drink’s El Jimador Silver is a crystal clear, young tequila made from Weber agave. Salted rim, optional. "A renowned, self-managed, master-planned community." Need some delicious, but easy garlic-based recipes for your upcoming dinner party? National garlic day is April 19th and to celebrate, we made two garlic centric recipes and shared them with LCA staff. Read our blog to find the recipes and find out the staff favorite!